WINNER OF GIGMASTER'S "TOP GUITAR DUO" FOR 6 CONSECUTIVE YEARS: 2010, 2011, 2012, 2013, 2014, & 2015!!! The Spanish Guitar Duo has performed for hundreds of private events including weddings, corporate events, school performances, and concert series for over 20 years. Elegance, professionalism and artistry are at the heart of the Spanish Guitar Duo, and are what has made this duo a winner of Gigmaster's "TOP GUITAR DUO" for 6 straight years. 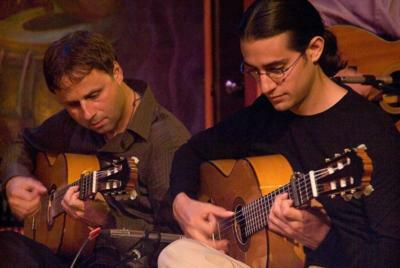 The Spanish Guitar Duo features Diego Alonso (guitar) and Carlo Basile (guitar) as well as other members of the renown ensemble, Las Guitarras de España. Along with Diego and Carlo, Bob Garrett (percussion), Greg Nergaard (bass), and Chihsuan Yang (violin) form the core group. The ensemble features original, instrumental Spanish guitar based material as well as some traditional flamenco, classical and fusion pieces sometimes incorporating vocals and dance. Other instrumentation is also available depending on our event's needs. Diego Alonso has performed, composed, and taught Spanish Guitar nationally and internationally throughout the last 10 years. He graduated with highest honors in Flamenco Guitar Performance from the Fundación Cristina Herren de Arte Flamenco (Seville, Spain) where he studied closely under flamenco luminaries Pedro Sierra, Niño de Pura, Paco Cortés, Eduardo Rebollar, Tino Van Der Sman, Javi Gomez, and Pepa Sanchez. Throughout his professional career, Diego Alonso has composed, and shared the stage, with many prominent musicians and ensembles including Rocío Márquez (flamenco voice), Jorge Pérez (flamenco percussion). Alfonso Cid (flamenco voice), Darwin Noguera (piano), Victor Garcia (trumpet), Alberto Sellés (flamenco dance), Chiara Mangiameli (flamenco voice & dance), Las Guitarras de España, Fulcrum Point New Music Project, and others. Diego Alonso is also the founder of "Spanish Guitar Chicago" and of the "Sonanta School of Guitar." He currently teaches Spanish guitar in Chicago, IL, and composes and performs flamenco and flamenco-jazz inspired music for various solo and ensemble projects. 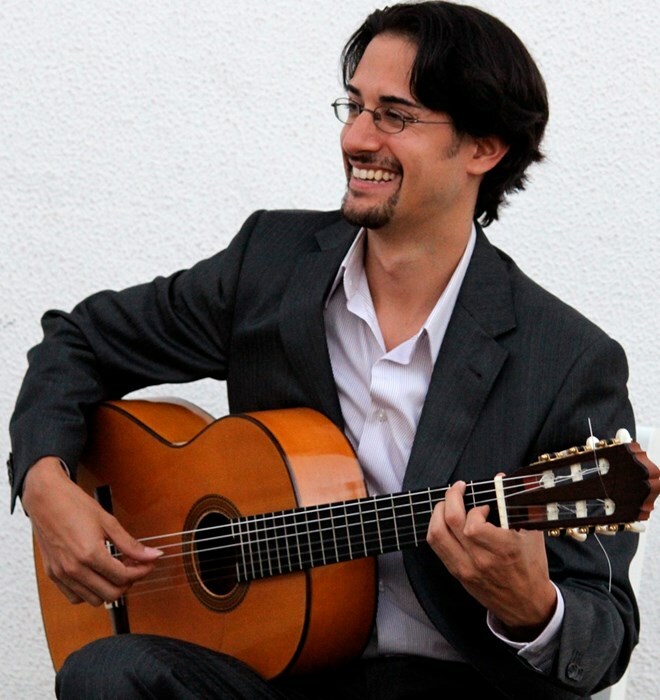 Carlo Basile has a Masters Degree in Classical Guitar Performance from NEIU. He studied for 7 years with Anne Waller (head of the Northwestern University guitar program). Basile also travelled to Spain a number of times to study flamenco in Andalusia with guitarists Luis Ruiz, Jose Luis Rodriguez, and Flavio Rodriguez. Additionally, Basile has visited over 30 countries to perform, teach, and study ethnic music. Basile has taught Spanish guitar workshops in places such as Chang Mai (Thailand), Cebu (Philippines), and Hanoi (Vietnam). He has performed and collaborated with noted artists such as Kinan Abou-afach (Syria), Morikeba Kouyate (Senegal), Sara Ranganathan (India), and Flavio Rodriguez (Spain/Brazil). Over the past 12 years, Basile has worked with Las Guitarras de España, a Spanish guitar-influenced world music ensemble which he founded. The ensemble has released 5 CDs to critical acclaim and has performed throughout the US for concerts, universities and major festivals such as SXSW. The Chicago Tribune has recently dubbed the ensemble's new work as “brilliant.” Basile's guitar work has been featured in various commercial radio and television spots. Most recently, Basile has composed and performed music for theater including Steppenwolf and Lookingglass Theaters. Basile was the featured musician in the Lookingglass Theater production of “Rick Bayless in Cascabel.” In that work, Basile was referred to as a “masterful guitarist” by a review in the Chicago Sun-Times. "Carlo Basile, a masterful guitarist, filled the room with gorgeous melodies" (Hedy Weiss, Chicago Sun-Times). "One of the guitar virtuosos on this planet!" (Rick Kogan, WBEZ). I found Carlo & Diego online through Gigmasters and from my first contact with Carlo, my experience was nothing short of great. I was throwing a party for my mother's birthday and expected about 40 guests. Carlo and Diego were not only utmost professionals beforehand in planning and organizing with me, but once there, they created an incredible atmosphere, playing an array of music to fit the mood and audience, from Spanish guitar to a flamenco version of Happy Birthday, and even tango for the tango crowd. The quality of the sound was also superb. I could not be happier with the experience of hiring Carlo and Diego and with their memorable contribution to the event. These guys were so so great. I didn't have to worry about what they'd play and when we had a 15 min delay in beginning the program they came and asked me whether.they should keep playing a few more minutes in the meantime. I really hope others in attendance at the event hire them for their events. The best decision I made in planning our event was hiring Carlo and David. Their talent, song selection, understanding of the audience, understanding of the venue, understanding of the event itself and what it called for, their ability to conform to the environment in which they played (which was a tropical jungle in Mexico with no electricity) all coupled with an amazing attitude and desire to give my guests the best performance possible made our wedding the most raved about event we or any of my guests have ever been to. We can not thank them enough! We couldn´t have been more pleased with Carlo´s performance. He was professional and accommodating during every step of the booking process and most importantly he added the perfect musical backdrop for our event. We had my husband´s family and friends from Spain in town to help us celebrate and his music was highly regarded by all of them - a true testament to just how talented he is! We also gave a copy of his CD to each of our guests as a thank you gift, which they LOVED - I would definitely suggest this. Highly recommended and I would not hesitate to book Carlo or through Gig-masters again. Las Guitarras/Spanish guitar duo made my wedding a really magical night. The sound was amazing! Vocals, guitars, cello and percussion all sounded great. I had quite a few musicians as guests who were blown away by the quality and talent. This band has such a wide range and pull off soft and calm as effortlessly as energetic and exciting! And of course when the percussionist added some flamenco dancing to the evening everyone was mesmerized and truly entertained. They were really so professional, so flexible and so so fun. I cannot say enough about how pleased we were with our choice! I would highly recommend this band for your next event! We could not have been more delighted with the music provided by Carlo & Diego. They performed a variety of classical Spanish guitar music pieces and even took a request to play a piece by the Gipsy Kings. Their music was absolutely beautiful & they are wonderful guitar players! We received many amazing comments & inquiries from our guests including the guests of honor on how much the enjoyed the music. Thank you Carlo & Diego for helping us create this beautiful memory for my brother and his wife on the their anniversary! They did a great job! Was just perfect for our event. Carlo and Diego were a fantastic addition to our outdoor event. Their music is simply beautiful and it added a chic and elegant vibe to our celebration. Guests commented on how much they enjoyed the performance. Can't wait for the next occasion to hire them again! The Spanish Guitar Duo was wonderful! They were very easy to work with and very professional. They helped make our wedding special and one of a kind! I would recommend them to anyone! We will match ANY bid from other qualified artists! Please note Spanish Guitar Chicago / Spanish Guitar Duo will also travel to Cicero, Berwyn, Oak Park, Forest Park, Hines, Lyons, Riverside, Brookfield, Maywood, River Forest, Summit Argo, Carol Stream, La Grange Park, Bellwood, Bedford Park, Melrose Park, Westchester, Burbank, Bridgeview, Hillside, Hinsdale, Hometown, La Grange, River Grove, Stone Park, Western Springs, Berkeley, Franklin Park, Justice, Norridge.